117 Westend Village, Blanchardstown, Dublin 15, D15 TY22. Baxter Real Estate are delighted to bring to the market this 2-bedroom, 2nd floor apartment, which occupies an area of approximately 66 sq.m./710 sq.ft.. The accommodation is briefly comprised of a very spacious living/dining room, which has a laminate floor and a sliding patio door leading to a balcony, and which overlooks a green area. The fully-fitted kitchen has a tiled floor and splashback. Both bedrooms have carpeted floors and built-in wardrobes. The bathroom, which has a tiled floor and bath area, services both bedrooms. Westend village is situated adjacent to Blanchardstown Shopping Centre and is within easy reach of all local amenities, including shops, restaurants and numerous leisure facilities. This apartment is close to Coolmine Train Station and the area is well serviced by Dublin Bus. The N3 is just a short drive away and provides easy access to the M50, Dublin city centre, and the national road network. Dublin Airport is less than a 20 minute drive away. There are many national and multi-national companies located in the Dublin 15 area including IBM, E-Bay, Bristol Squibb Myers. Please note that all information is given for guidance purposes only. We have not tested any appliances and all parties must undertake their own investigation into the condition of these appliances. Living/Dining Room - 23' 3'' x 12' 8'' (7.088m x 3.871m) - Laminate floor, feature electric fireplace, sliding patio doors leading to a balcony. Kitchen - 9' 5'' x 6' 1'' (2.878m x 1.843m) - Tiled floor and splashback. Bedroom 1 - 13' 1'' x 8' 8'' (3.981m x 2.654m) - Built-in wardrobes and a carpeted floor. Bedroom 2 - 10' 10'' x 8' 6'' (3.301m x 2.58m) - Built-in wardrobes and a carpeted floor. Family Bathroom - 6' 5'' x 6' 1'' (1.968m x 1.852m) - Tiled floor and bath surround. * 2-bedroom, 2nd floor apartment. * Excellent location beside Blanchardstown Shopping Centre. * Balcony overlooking a green area. 1 Orchard Grove, Blanchardstown, Dublin 15, D15 KT2R. 4 Rosemount Terrace, Arbour Hill, Dublin 7, D07 HWF2. 23 Willan's Drive, Ongar, Dublin 15, D15 E6H9. 5 Villa Park Gardens, Navan Road, Dublin 7, D07 CDW0. 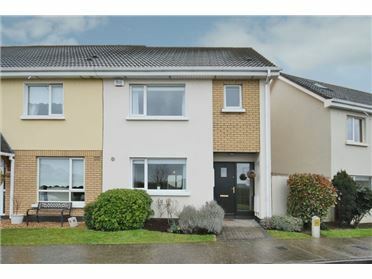 8 Warrenstown Close, Blanchardstown, Dublin 15, D15 W8P8. 2 Woodvale Grove, Clonsilla, Dublin 15, D15 E9NE. 21 Lohunda Crescent, Clonsilla, Dublin 15, D15 X37W. 123 Brandon Square, Waterville, Blanchardstown, Dublin 15, D15 E653. 34 Wellview Grove, Mulhuddart,Dublin 15, D15 EKK7. 10 Westway Rise, Blanchardstown, Dublin 15, D15 A02N. 51 Rosedale Close, Clonee, Dublin 15, D15 N7Y8. 14 Manorfields Crescent, Clonee, Dublin 15, D15 K0Y7. 29 Huntstown Lawn, Mulhuddart, Dublin 15, D15 EV9W. 53 The Crescent Building, Park West, Dublin 12, D12 T299. 9 Annfield Court, Castleknock, Dublin 15, D15 X6K0. 10 Inglewood Close, Clonsilla, Dublin 15 D15 RRC6. 43 Villa Park Gardens, Navan Road, Dublin 7, D07 W22C. 15 Westway View, Blanchardstown, Dublin 15, D15 R6TF.